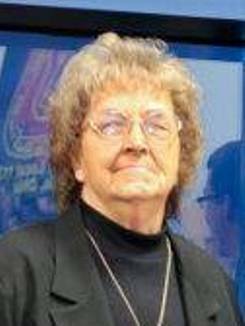 Gladys Hazzard, 79, of Lindsey, OH passed away on October 6, 2018 at ProMedica Memorial Hospital in Fremont, OH. She was born on February 20, 1939 in Fremont the daughter of Cletus and Flossie (Bardus) Bundschuh. She was a 1957 graduate of Fremont Ross High School. Gladys married Richard Hazzard on June 29, 1957 at St Mark Church and preceded her in death on April 28, 2018. She was employed at Buckeye Mart, Big Wheel, De’s and Ludwig LP Gas. She was also the Water Clerk for the Village of Lindsey retiring in 2015. Gladys enjoyed watching NASCAR and stock car racing. She enjoyed her customers at all the places she worked and spending time with her family, especially her grandchildren and great grandchildren. Gladys is survived by her children, Jim (Lisa) Hazzard of Tennessee, Kim (Jim) Smith, Lindsey, OH, Beth (Brian) Hoffman and Rhonda (Bill) Taylor both of Fremont, OH; sister, Beatrice Grobe of Iowa; seven grandchildren and ten great granddaughters. She was preceded in death by her parents; husband, Richard Hazzard; siblings, Patrick Bundschuh, Anna Rose and Richard Bundschuh. Visitation: Saturday, October 13, 2018, from 1:00 – 2:00 pm at Faith Lutheran Church, 1187 County Rd 128, Fremont, OH. A Memorial Service will follow at 2:00 pm at the church. My heartfelt condolences too you all!!!! Beth, you have my deepest Sympathy, I pray that God will help you through this difficult time in your life! Sorry for your loss, enjoyed talking with Gladys while paying my bill at Ludwig. May God’s great love comfort and bless you all. Hazard. We were graduates from Ross High School, Class of 1957. So sorry for the loss of all her loved ones. Prayers for peace and fond remembrance as you deal with this loss! Just returned from vacation. I worked with Gladys two years in credit at Big Wheel. Hard worker and always a cheerful laugh and smile. My sincere thoughts and prayers to you children grandchildren Wonderful to have known her.